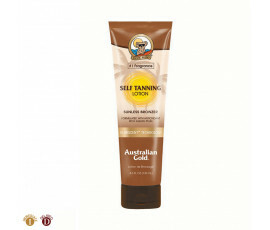 Australian Gold self-tanning lotions give a wonderful, natural sunless golden tan and enhance the skin while hiding imperfections. The main active ingredient is Dihydroxyacetone (DHA), a carbohydrate that ties to exterior skin proteins to stimulate the darkening effect. No more stains or streakes for a perfect sunless tanning. 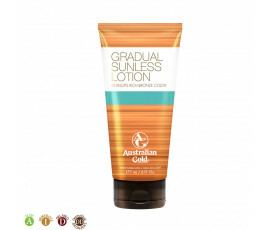 The ultimate blend of natural ingredients, such as DHA, Erythrulose and Caramel, give an absolute natural sun-kissed glow all year long. There are no side effects in using this whole range of products: they are perfect for anyone. Aloe Vera: Softening, hydrating, regenerating, healing properties are given by active ingredients.